The four prinicples that can help us to overcome our brains' natural biases to make better, more informed decisions -- in our lives, careers, families and organizations. In Decisive, Chip Heath and Dan Heath, the bestselling authors of Made to Stickand Switch, tackle the thorny problem of how to overcome our natural biases and irrational thinking to make better decisions, about our work, lives, companies and careers. When it comes to decision making, our brains are flawed instruments. But given that we are biologically hard-wired to act foolishly and behave irrationally at times, how can we do better? 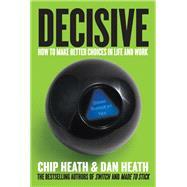 A number of recent bestsellers have identified how irrational our decision making can be. But being aware of a bias doesn't correct it, just as knowing that you are nearsighted doesn't help you to see better. In Decisive, the Heath brothers, drawing on extensive studies, stories and research, offer specific, practical tools that can help us to think more clearly about our options, and get out of our heads, to improve our decision making, at work and at home.